In the late 16th century, General Toyotomi Hideyoshi, better known as Taikosama, rose from humble origins to become the absolute ruler of a united Japan. As is often the case, the more he accomplished, the more he wanted. But it turns out he had his limits. When he attacked Korea to in an effort to gain a foothold on the mainland, China entered the war, and Hideyoshi's troops were beaten. This defeat, in addition to an earthquake that ruined his lovely new palace, left Hideyoshi in something of a financial bind. Enter the Franciscans. -- You see, the Portuguese had a lock on Japan's trade with China; their large wooden ships were contracted to carry cargo between the islands and the mainland. When Franciscan friars came from the Philippines, Hideyoshi hoped that the Spanish in the Philippines would be able to offer the Portuguese some competition. If he allowed the Franciscans to stay, even though Christianity was illegal, they would facilitate Spanish trade. With competition, prices would fall. One day, the San Felice, a Spanish galleon leaving Manila with a cargo valued at more than a million and a half silver pesos, was driven off course by a typhoon. It was shipwrecked off the coast of Japan and a local samurai took possession of the cargo. The Franciscans, thinking Hideyoshi was favourable to them, appealed to the general on behalf of the owners. However, Hideyoshi wanted the treasure for himself, but had no desire to hassle with the Spaniards. Since he was not only a general, but a consummate politician, he did what many politicians do in such situations – he smiled, made promises, and waited. This is where things get a little blurry, as they often do in international politics. While Hideyoshi procrastinated, the Portuguese, who resented the Spanish incursion into their lucrative trade monopoly, accused the pilot of the San Felice of having boasted of Spain's many conquests and also accused the local Christians of supporting them. In the ensuing arguments, Hideyoshi’s attitude towards the Franciscans changed. Although, to be fair, it was already strained as they had been gaining a great number of conversions among the Japanese. This angered the general because the Jesuits had promised to keep a low profile on the spiritual front. Whatever his reason, Hideyoshi ordered the execution of all Christians, including the Jesuits. After he thought it over, however, his love of wealth influenced him again and deciding the Jesuits were too useful for trade to be killed, he spared most of them. However, an example had to be made, and thirty days of torments began for twenty-five Christians: seven Franciscans - mostly from Spanish and Mexican origins, and eighteen locals. They spent the thirty days marching to the place of their execution, Nishizaka Hill in Nagasaki, where Terazawa Hazaburo, brother of the governor, was to perform the executions. During the march they were beaten, whipped, and had their left ears cut off, all in an attempt to get them to renounce their faith and tell their converts it was all a lie. They refused to do so. You may have noticed that the previous paragraph only mentions twenty-five men and the title of this article calls for one more. His name was Matthias. He was actually a Japanese convert who took a biblical name (it was the custom among Jesuit converts). Other than this we know nothing about him. He was among a crowd of people following the procession as it made its way to Nishizaka Hill. The soldiers who were escorting the condemned grew tired of the crowds calling for the release of their prisoners. They chose to make an example of one of the them and arrested and condemned Matthias on the spot. Besides, there was supposed to be a man named Matthias among the condemned but the soldiers had been unable to find him – this one would do. When they arrived at the hill, twenty-six crosses were waiting for them. Once they were all securely tied, the crosses were lifted into place simultaneously. Some sang hymns, others prayed, none wept or cried out, not even 12-year-old Louis Ibaraki, the youngest of the group, who witnesses testified called out encouragement to his older brethren throughout the ordeal. From his cross, Paul Miki, a Japanese convert, preached: "I have committed no crime, and the only reason why I am put to death is that I have been teaching the doctrine of Our Lord Jesus Christ. I am very happy to die for such a cause, and see my death as a great blessing from the Lord. At this critical time, when, you can rest assured that I will not try to deceive you, I want to stress and make it unmistakably clear that man can find no way to salvation other than the Christian way." The execution of these men started a 40 year persecution of Christians in Japan that would see tens of thousands martyred for their beliefs. It should be noted the twenty-six did not die from the crucifixions. Moved by some small compassion and impressed with the courage of the Christians, Terazawa ordered the soldiers to kill them quickly by spears to the throat. 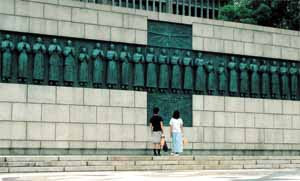 A memorial to the martyrs (pictured) has been erected in Nagasaki. It was February 5, 1597 — 410 years ago this week. February 4, 1906: Lutheran pastor and theologian Dietrich Bonhoeffer is born in Breslau, Germany. Author of The Cost of Discipleship (1948) and Letters from Prison (1953), he was one of the leaders of Germany's Confessing Church, which opposed the Nazis. Believing that Hitler was like a madman "driving a car into a group of innocent bystanders," he had joined a plot to kill him, but the plot was discovered and Bonhoeffer was arrested and eventually hanged--just days before Allied troops liberated the concentration camp where he was held. February 6, 891: Photius, patriarch of Constantinople from 858-867, dies after a series of excommunications and restorations. His 867 encyclical, which denounced the presence of Latin missionaries in Bulgaria as an intrusion and objected to the clause in the creed that read "the Holy Ghost ... who proceeds from the Father and the Son", was significant in the East-West conflict that eventually led to the Great Schism. February 7, 1938: After years of being closely watched by Nazi secret police, Lutheran pastor Martin Niemoller is put on trial. He was subsequently confined in a concentration camp, but he survived and went on to hold a leadership role in the World Council of Churches from 1948-1968. February 8, 1587: Mary, Queen of Scots, is beheaded. Attempting to restore Catholicism to England, she began persecuting Protestants. But, largely thanks to the work of John Knox, her attempts failed. February 9, 249: (traditional date): According to Dionysius, bishop of Alexandria, on this date, Roman officials "seized that marvellous aged virgin Apolloinia, broke out all her teeth with blows on her jaws, and piling up a bonfire before the city, threatened to burn her alive if she refused to recite with them their blasphemous sayings. But she asked for a brief delay and without flinching leapt into the fire and was consumed." February 10, 1751: John Wesley suffers a fall on the ice-covered London Bridge and is carried to the home of Mary Vazeille, a sailor's widow who lived nearby. Within a week, the two were married—with disastrous results. The unhappy couple spent so little time together that, in 1771, Wesley recorded this in his journal: "I came to London and was informed that my wife died on Monday. This evening she was buried, though I was not informed of it."